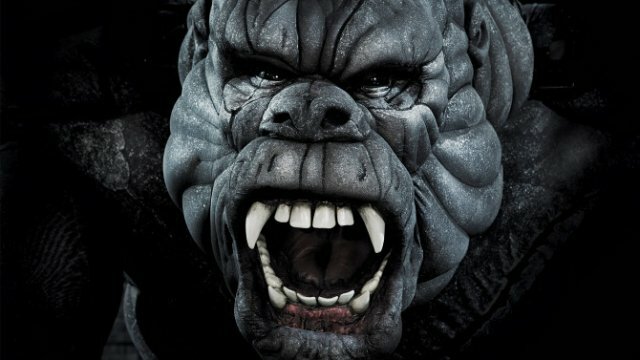 Hollywood has immortalized the character of King Kong in five films over the years beginning with King Kong and Fay Wray (1933), then Jessica Lange became his leading lady in 1976. 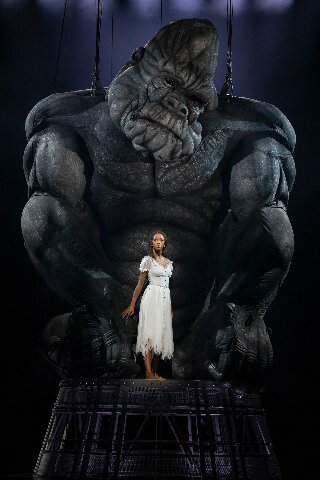 Actor Naomi Watts caught the eye of Kong in 2005, and Linda Hamilton reprised the Ann Darrow role in 2006. Up to then, the Kong story revolved around the great ape's love for his leading ladies and in protection of them. 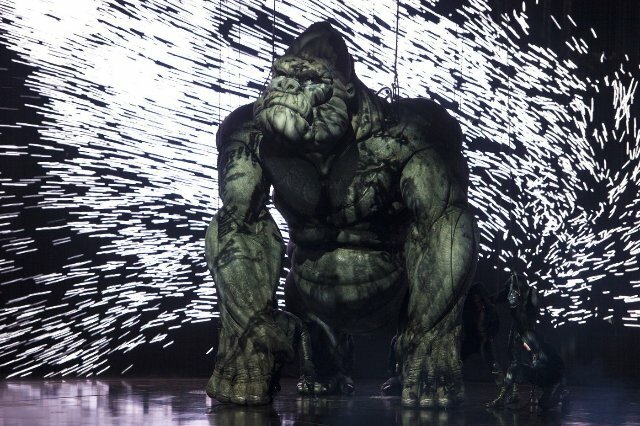 How to achieve the feat took the vision and skills of many creative experts in the fields of robotics, puppetry, and stagecraft, plus the artistry of stage technicians, engineers, and programmers necessary to breathe life into the great ape. 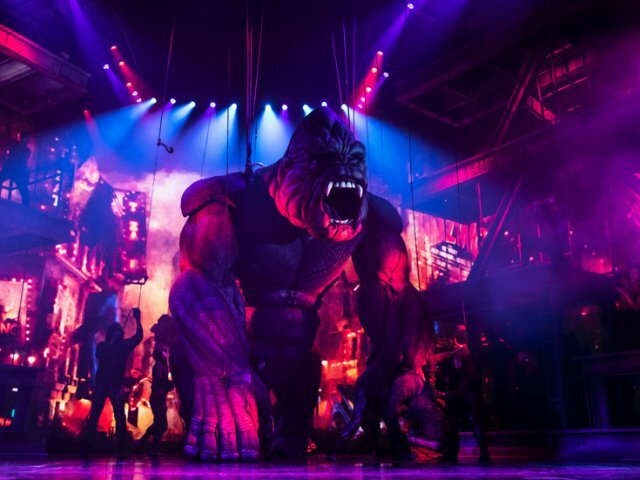 One of Hollywood’s most iconic characters of the screen now becomes a jaw-dropping, mesmerizing theatrical experience in staging and execution. It’s an exciting visual feast for the eyes and ears of the audience. There are three principal actor is this visually spectacular production: Pitts, as Ann Darrow, who makes her second appearance on Broadway with this role. She is young and pretty, and her voice, while not a strong Soprano, gets the job done. Morris has the unappealing – from the audience’s POV -role of Carl Denham; part con-man, part sleaze filmmaker/hustler. He has a line of gab worthy of P.T. Barnum who’s a greedy opportunist with visions of amassing millions of dollars by exploiting the world’s largest gorilla. Denham never loses sight of the pot of gold that is almost within his grasp. But first, he must find, capture, and return Kong to New York. It’s his all-consuming goal, whatever the cost to others may be. Denham’s loyal but somewhat dim employee Lumpy, (played by Erik Lochtefeld) acts comic relief. Regardless, the human actors know who the real star of this production is. 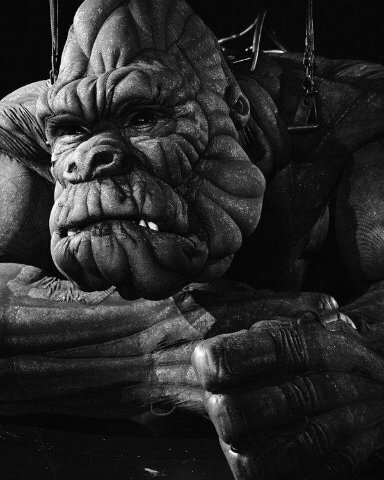 He’s a 20-foot tall gorilla with an attitude, despite soulful eyes and countenance. This fresh take on “King Kong” tells the story visually with imagination and flair in a highly entertaining way. Simply put, it's a crowd-pleaser of a show which, no doubt, will garner a raft of Tony Award nominations come April 30th of 2019. In the final analysis, however, it’s the audience who are always the final arbiters of whether a show is a success financially and/or creatively.